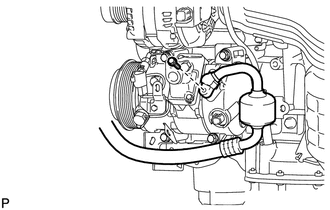 (a) Remove the bolt and disconnect the cooler refrigerant discharge hose from the compressor and magnetic clutch. 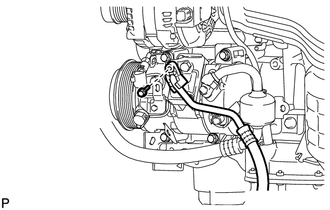 (b) Remove the O-ring from the discharge hose. Seal the openings of the disconnected parts using vinyl tape to prevent entry of moisture and foreign matter. 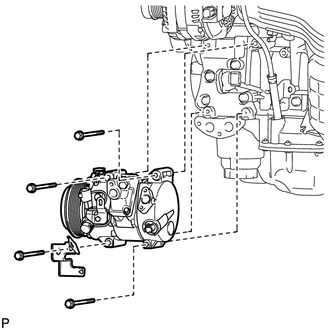 (a) Remove the bolt and disconnect the suction hose sub-assembly from the compressor and magnetic clutch. 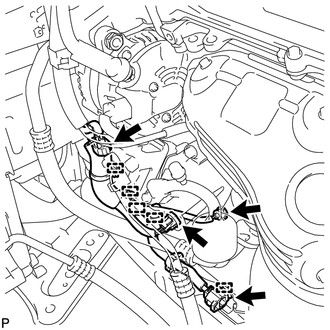 (b) Remove the O-ring from the suction hose sub-assembly. (c) Remove the 4 bolts, bracket, and the compressor and magnetic clutch.